The ten years during which the Mount Jawor Chapel remained without custody, vulnerable to acts of profanity, put a strain on the temple's condition. At this time, Glafiria's grandson, Wlodzimierz Okarma, got involved in the initial restoration works. However, the ad hoc construction repairs of the thirty year old building were insufficient. The entire roofing required replacement. The original shingles that had been used according to the local architectonic customs and added special beauty to the chapel, got rotten, resulting in multiple water leaks inside the temple. There were few faithful in Lemkovyna, moreover their financial condition has been strained by loans taken for repurchasing their farms that had been appropriated during resettlements. Anna Okarma turned to her godfather, Piotr Kurylo from the village of Blechnarka, who after the war turmoil joined the already considerable Rusyn emigration in America. He and, after his death in May 1962, his son Stefan organised collection for the restoration of the chapel. As a result, a bank transfer for the amount of four hundred dollars designated for purchasing zinc sheets arrived to the country. According to the account of Stefan Kurylo, the construction master Jozef Ferenc for unknown reasons purchased just regular zinc sheets and of such a large thickness that finding a professional willing to undertake the chapel roofing work using those materials was a very challenging task. The roofers who, overestimating their own capabilities, for a high price finally agreed to perform roofing, were allegedly giving up the onerous job several times. After the completion of the most urgent repairs, the interior restoration could be started. Anna Okarma who, after the return of the faithful to their land, became third consecutive custodian of the sanctuary (after Glafiria and her confidential friend Anna Demianczyk from the village of Huta Wysowska), hired painters in order to renew the chapel walls. Due to the chapel location two kilometers away from the village, three painters were staying in the temple choir for the nights during the renovation, to save time and effort. Already on the first night, late Friday, they became witnesses to supernatural phenomenon. Shortly after going to sleep, before they fell asleep, they suddenly heard the chant of the Divine Liturgy. As the hour was late and the village quite far away, they suspected that an unusual event was taking place. It was an admirable singing of mostly male voices, of stable strength, neither quiet nor loud. It lasted quite a long time. This event reoccurred twice - on Wednesday and on Saturday evening, when the only person present in the chapel was the construction master who until that time considered himself atheist. Every time, the chant was coming from the side of the stone cross with the figure of the Mother of God, that had been set up years ago at the request of the Mother of God. Also extraordinary is the history of the icons from the Mount Jawor which were donated by the faithful, mostly as votive offerings to the Mother of God. With the coming of the war that entailed resettlements of population, some people (not all of them being donors) were taking the donated icons with them, on their departure. Two icons have been taken by the head of the village of Wysowa, Michal Ferenc, departing to Ukraine. Years later, when his life was coming to an end, his last days were accompanied by severe pains. After the week of great sufferings, his brother in law, Jacek Wasylczak, found out in his sleep that the misery will be over, once the Mount Jawor icons are returned to the local church. He did so and the promise has been fulfilled. About half a year later, when other emigrant from Wysowa, Konstanty Nazar, was moving to the Black Sea region, joining other people from Wysowa who already lived there, the widow of the former head of Wysowa village, has received order in her sleep that Konstanty should take those two icons, so they can return to the Mount Jawor at a later time. Konstanty, although the order seemed odd to him, didn't dare to oppose. There was no church in the village where he arrived. 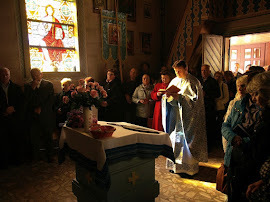 When he appeared there with the unexpected items, a provisional chapel has been arranged in the house of a former Wysowa inhabitant, where - keeping strict secret from the communist regime - the emigrants from Wysowa were coming on Sundays to worship the Mount Jawor icons. The situation continued until the time when one woman, emigrant from Wysowa, decided to return to her village. In this way, the two icons "Jesus on the Mount of Olives" and "The Sacred Heart of Jesus" came back to the Chapel on the Mount Jawor. The icon of the Virgin Mary and Child, that the visionary's daughter had found half-burned and with traces of cuts, has been renovated with her efforts in Krakow in 1969. After the war, the Greek Catholic Church didn't enjoy freedom. Despite the efforts of the faithful, the decision of the communist authorities in November 1958 granted the temples in Hanczowa, Blechnarka, and Wysowa along with the "border chapel" to the Orthodox Church. Unexpectedly, the Chapel had now different custodian and the later interventions of the Roman Catholic parish rector and the bishop Jan Stepa from Tarnow haven't managed to change this situation. However, the Mount Jawor indulgence feast celebrations have been resumed. Since then on, instead of the May feast of the Saint Nicholas the Wonderworker venerated with special honour in Lemkovyna, the indulgence feasts have taken place on the feast of Saints Peter and Paul (observed on the 12th of July, by the so-called Old Style). Already one of the first celebrations was attended by a group of pilgrims from the neighbouring Slovak village of Cigel'ka. They procured special permits to cross the border. In the communist period, such undertakings were facing difficulties not easily understandable today. Thus the life was coming back to the Mount Jawor, though in new form and circumstances, yet clearly and irrevocably.